I doubt it works on anything older than Win2000, however, if someone compiles it with an old enough GCC and a version of SDL that works on Win98, it would work. That won't be me, though, I haven't used a Win9x computer in a LOOOOOONG time. I fixed the toxic slime bonus bug. No progress yet on the strange sedoric problems. Oh, what was the reason of the toxic slime problem ? The routine at A executes identically from cold boot or reset, and passes control to the next phase. The routine at B uses the X register to count down how many sectors to read from the disk. If i run oriculator, set a breakpoint at $b966, then insert the toxic slime disk, the first execution of $b966 has 4 in X, so only 4 sectors are read. Upon reset, at the same point, X is $3C. If I start Oriculator, set a breakpoint at $b966, insert the toxic slime disk, and then change X to $3C, clear breakpoints and exit the debugger, the toxic slime disk boots and runs flawlessly without any resets. So all we need to do now is reverse engineer the code that sets up X as the number of sectors to read and figure out why it fails from cold boot. It seems to me that it only works after a reset because before jumping into the sea of BRKs, it sets up the interrupt vector to point to $d0a5. Then, when you reset Oriculator, that vector changes the checksum calculated in step 8 to be non-zero, so on the second time through, steps 11, 12 & 13 are executed, and X contains $3C instead of $04, and a lot more sectors are therefore read from the disk. 1. What is *supposed* to be @ $c980 to be checksummed? 2. Why isn't it there? 3. Why does anything at all being in overlay RAM make it read $3C sectors instead of $04? And the only answers I have right now are "I don't know". Edit: Could someone who knows their way around euphoric's debugger boot the toxic slime disk, break @ $b92e and dump the contents of $c980-$ffff ? Right, well, what this tells me is that the boot sequence definately goes wrong before the sedoric logo appears and the second phase takes over (because by the time the sedoric logo appears, we should have stuff at $c980, and we dont'). Which means the fault happens when oriculator is executing the microdisc rom. So I guess I should go back try again at disassembling that rom. Could it be related somewhat to the fact that the microdisc rom is only 8k, while the overlay area is 16k, I'm not quite sure what is supposed to be visible when the eprom is active in the first 8kb of top memory. I don't think so. I'm pretty sure i'm handling that correctly. Anyway, i'm continuing my previous work of making a commented disassembly of the microdisc ROM. The only reason I stopped was because when investigating the "reset seems to fix it" behaviour, it seemed to point to the sedoric code, but that was a red herring. Edit: In fact, I know my overlay ram/disk rom stuff is right becuse the microdisc rom wouldn't even get past the ramtest it does right at powerup otherwise. 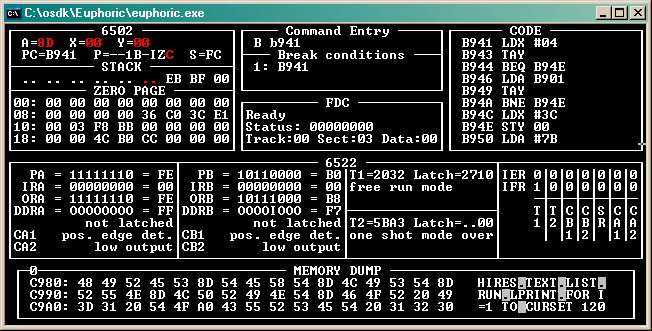 There's a commented disassembly of the Microdisc eprom (in English). Mile is this doc in thé Oric library? Mile is this doc in your Oric library? Actually, it seems it's originally from Fabrice (André names him in Sedoric à Nu). I've just uploaded a new WIP build. No progress at all with the disk stuff, but i've added some commandline options. You can see the commandline options here (or just read ReadMe.txt after downloading the WIP build). Nice this is improving and improving. Good work Xeron! Hope you find the bug with sedoric soon.